Improvisation is a valuable skill for any performer, even if you plan to use only fully scripted material. There is always a possibility of something going wrong, and improvisation can dig you out of the hole. Likewise, comedy is a great training ground for performers because a good comedy scene has everything a good dramatic scene has, PLUS the humor. This book, therefore, presents fun comic improvisation exercises and structures, ranging from the very simple and basic to the very sophisticated, which require considerable skill to pull off. Read more...Many of the improv exercises in this book are well suited to a classroom setting and could be a very useful tool in training actors, while many of the scene structures are designed specifically for use in true performance situations on stage. 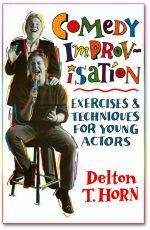 This comprehensive book has it all: the basics of improv, improvisation in the classroom, simple and advanced improv structures, character improv structures, advanced acting exercises, forming a comedy improv troupe and putting on an improv show.